Vol. 4 - Frederick Heinrich Gelwicks, Shoemaker and Distiller-- Accounts, 1760-1783-- An important 18th century record from Manheim Township, York County, Pennsylvania. Vol. 10 - Records of Purchases at the King George Hotel, Schaefferstown, Lebanon County, Pennsylvania 1762-1773--Records from Alexander Schaeffer's tavern and store. Vol. 11 -Records of Pastoral Acts at Zion Lutheran Church, Harrisburg, Dauphin County, Pennsylvania 1795-1827--Records from the first Lutheran church established in Harrisburg. Vol. 12 - Records of Pastoral Acts at Christ Lutheran Church, Stouchsburg, Berks County, Pennsylvania, Part I-- This volume presents baptisms from 1743-1819. Vol. 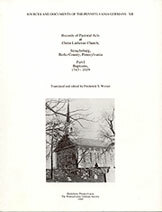 13 - Records of Pastoral Acts at Christ Lutheran Church, Stouchburg, Berks County, Pennsylvania, Part II-- This volume includes baptisms 1820-1835, marriages 1744-45, 1748-52, 1771-1851, burials 1748-54, 1771-73, 1811-1851, confirmations and communicants 1743-1789 and other records 1743-1758.